I mentioned on the Tiny Houses Australia Facebook Group page that I would document my knowledge of CAD (computer aided design) and how it relates to the tiny house building community, well here it is. Hope it helps. Okay, full disclosure, I work for a CAD software reseller, I have done for nearly 3 years. If you think this article is in any way bias please let me know and you have my permission to give me a big pinch on the arm. Let’s face it, most of what you can do with CAD software you can do with a pencil and a ruler and for many centuries before that people just made stuff by eye. Where the CAD software gives you an advantage is in speed. So the first aspect to think about is how quick you need to get your design done and then ask yourself how far through the design process you want to go. 2D means when you draw you only enter X and Y coordinates, you can still draw something viewed from an angle but it is very difficult. 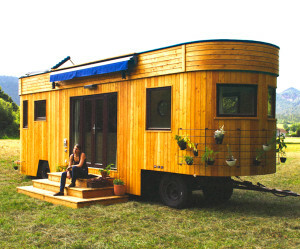 So how does this affect the tiny house designer? I feel that most people reading this are looking for something very cheap (under $100) or free that turns their 2D sketches into a 3D view but at the same time are not designing for manufacture. By that I mean they’re not thinking about every nut, bolt and screw. If you are though you need to be looking at the semi-pro or pro level. The further you move down the following list of software the more time you will have to devote to learning how to use them, also the more powerful a machine you will need to run it. But it also means that designing will be faster, balance that with the fact that the more expensive they become. So the sky’s the limit and there’s no such thing as a free lunch. If it doesn’t cost you money it’ll cost you time. And unless you are building it by yourself and for yourself you will need a good set of plans generated by at least a semi-professional. But isn’t this really the same thing? In the end it’s all trlingaes, whether rendered on a screen or cut in steel. Triangles are trlingaes.The only time things move away from tri’s is in the application system of the modeling tools themselves.Based on conversations I’ve had, I’m not so sure this is an issue of whether or not a unified format is possible as much it may be the likelihood not many people have seen a need for such a thing.Why *not* have a parametric, history-based, flexible yet accurate modeler which saves to a file format which can go basically anywhere? Hollywood has been moving away from NURBs and toward SubD’s. Why not manufacturing? From what I’ve been told by someone I’d consider qualified to know, a SubD modeler with much of the same functionality of most solid CAD modelers is possible.I may be the only one asking for this, but I honestly believe some day a whole lot of people will want the same thing, because I believe future marketing and manufacturing systems will converge in ways we’ve not yet seen and just-in-time will take on a whole new level of meaning. We may as well start considering it now, afaic. Previous Previous post: Is 3D CAD training worth the investment in time and money?